I just have one thing to say about the Healthcare bill: I don't want to hear it. Now that I got that off my chest... in the wake of today's arguing & other nonsense, I was thinking about Chad & I choosing to live simply, within our means, etc. (Yeah, I don't know how I got from one train of thought to another.) I'm so glad that we've made that choice, and so grateful for the jobs we have that have allowed us to pursue this lifestyle. Friend (F): Hey, are you & Chad going to take Financial Peace University? I: We don't need it. F: But you'll learn how to live within your budget. I: We already live within our budget. F: But you'll learn how to save to buy another car. I: We have a car. F: Buy you could get another one! I: We don't need another one. F: Or you could save up to buy a house. I: We're already saving to buy a house. F: Oh! Well, maybe you can go ahead & get a house & work it into your budget now instead of waiting. I: So, you're saying we should do Financial Peace University so we can learn how to spend our money on stuff we don't need or can't afford? F: No! It will teach you not to do that. I: We're already not doing that. And so on. It makes me laugh. I don't know why other people are so keen on us doing Financial Peace University, unless it's the universal this-is-great-you-should-try-it thing that I usually reserve for books. Which is fair enough, if only they were less determined to find a way that we're not doing it right. I'm so thankful as well that God kept us from the desire for stuff. If I were constantly longing for a faster car or a big house or flashy jewelry or designer clothes... wow, I'd be so miserable. I wish I knew how to help people who do have that kind of longing. I guess I could recommend Financial Peace University. I need to add a disclaimer: I realise that my reflections on these words/sayings/verses are going to be wildly yanked out of their original context. I am not worried about that, because they don't float around in my head in context. What you read here are the musings of a random-access memory doing what it can with a phrase or two. I use this verse. I use it as an excuse to not care. I use it as a reason to not be offended. I use it as justification for not defending myself or demanding my rights when the situation may warrant it. I use it... pretty much how I want to use it. When someone in traffic cuts me off. When a coworker complains for no apparent reason. I'm glad (mostly) that this verse hangs out in my head. I'm grateful that it crops up when I'd least like it to, because it means that whole "write my words on your heart" thing really is working out like it's supposed to. I want to do this better. I want to do this well. I want to remember that the universe does not revolve around me, and that when we're all sharing the same planet, sometimes I'll be the one who is wronged. Last year for St. Patrick's Day, I made sure to load up the iPod with the Irish & Celtic Music St. Patrick's Day special, and it was a good one. Include in it was a very amusing song entitled, "Saint Patrick Never Drank." Look it up, listen & enjoy! So, I celebrated St. Patty's Day by sleeping in until 6:30 AM. It's a wild & crazy life I lead. I dug out my special green ribbon with the shamrocks on it to wear in my hair & was all set for a day of... work. 'Cause that's what I did all day. And in the evening, Chad & I dropped by Sunset to hear Chad's friend Eli speak. (I guess after knowing him my entire married life I can call him my friend, too... I just don't feel like I know him quite well enough for that yet, since I'm a bit British in my approach to "friend" and "acquaintance". Perhaps a subject for another time.) And as ever, he was very encouraging to hear. Chad, by the way, had all four wisdom teeth out on Tuesday & so he was a bit drugged for the whole thing Wednesday night, but he was no less encouraged and is already patiently waiting for the lesson to appear online in mp3 format so he can hear it again. And actually, I am too. We finished off our wild night with a trip to United-- no day is complete without going to get groceries, I always say!-- to get some more soft foods for my unfortunate husband. I hope he gets better soon, or Lubbock may run out of pudding. 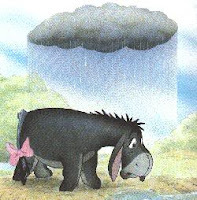 I'm having a very Eeyore-ish week. I have no idea where it came from; presumably, there was a cause, as yet unknown to me. At present, I don't really want to do anything, including blogging, although I am pressing on in hopes that blogging will turn out to be cheaper than therapy. I had a fantastic, crazy-good run yesterday, which I was in no mood to replicate this evening. My favourite holiday (the first day of spring) is tomorrow, but it's supposed to snow. Bah! Humbug! Anyone who is around me for more than five minutes knows of my firm belief that life-- or at least my life-- is a string of awkward moments. I was out running on Thursday evening, a hard & fast run, and I was having to push myself to keep going. Meanwhile, lots of things on me were hurting-- it comes with the territory. And then an amazing thing happened. A particular moment in my life, one I've always remembered with a great deal of embarrassment and maybe a smidge of "yeah, that was kind of cool", suddenly leaped into my head seemingly out of nowhere. (Seriously, I've no idea where the thought came from.) And just then, I realised that this memory was not only not embarrassing, but it actually was really, really cool and I'm pretty happy to have it stored in my memory banks. And then I realised something else-- I was running faster. I had a smile on my face. All the hurting & breathing hard had been forgotten for that brief minute that I was back reliving the memory of one little moment. Such is the power of a happy memory. I'm not going to share the moment itself on here; cool though I now know it was, it was still a bit awkward & I have to tell it in person to really do it justice. So if you must know, ask me when next you see me. Yes, I really do love you THAT much. I think I'm turning my blog into a South Plains love-fest. Meh. It's my blog, right? I know half of my followers are SP people, so I may as well express my appreciation. Last night Chad & I went to a special event at another church in town, so it didn't really feel like a Wednesday night. I've caught myself thinking "I'm going to South Plains tonight" many times today, only to have to remind myself that it's Thursday & I have to wait until Sunday to see our church family. At the risk of sounding trite (or giving any of my readers a cavity), the Lord has blessed us with the people at South Plains. I never saw it coming, that's certain! The first few months at SP I was convinced that it was not the place for me. I'm so happy that I was wrong. But I would catch myself at it, too, particularly in high school when I wished for my newly-graduated friends back again in the drama club. And of course it hit me again when I was an aim student; the aim program is, after all, one long series of good-byes, and I often wished I could rewind a few months and have all that fun again. In my adult life, though, is where this verse has taken on a more serious tone. Of course I want to go back to a time I enjoyed; of course I want to undo some unpleasant changes that have happened in my life, of course I want my deceased loved ones back again. But to wish to turn back the clock... No, Solomon was right. Such a wish is unwise. First of all, it's unwise just because I was less wise then! Pretty simple concept, I should think. How else could I learn & grow if not from living through the rough stuff? How could I possibly enjoy the good times for what they are, if I didn't know what the opposite was like? Second, I know for sure that I'm looking at the past with rose-tinted glasses. More focused reminiscing brings back the awkwardness, the unhappiness, and the other icky parts of living that I've had at every stage. In fact, too much time spent recalling the past in this way leads me to want to hide under something just because the flood of embarrassment washes over me. And most importantly (to me), wishing for the past to return denies God's ability to do something fantastic with my future. When I lived in Scotland, I felt like I had real friends for the first time in my life. Guess what? I have that now at South Plains, but it took me a looooong time to see it because I was so focused on what I had left behind. While what has happened before, and the people I knew before, may be wonderful, that doesn't mean that God doesn't have something just as great happening in my present, or that the future will be any less fantastic for having had a brilliant past. The road ahead is hidden, and God only gives us one step at a time. But I'll never see it if I can't take my eyes off the brightly illuminated road behind me. Chad & I are moving again. So, in eight years of marriage, this is move #4. And I would be less annoyed about this (and less tired just thinking about it) if I didn't know that move #5 is looming on the very, very close horizon. You see, we don't move just because it seems like fun. (We know better.) And despite all appearances to the contrary, we don't move just to get rid of stuff. (While it is a nice side effect, we are actually quite capable of getting rid of stuff without changing venues.) We only move when the correct set of circumstances comes our way; for instance, when we have a downstairs neighbour who is a prolific smoker and we can't breathe in our own apartment without coughing. In this instance, we can get a better short-term option across town, and because we aren't sure what we will be doing in 6 months' time, we aren't willing to commit to another 12-month lease. So, I'm wrapping up my knickknacks in cushion-y stuff (read: clothes), making a stack of things I'd like to give away, and throwing away anything that I don't want and can't imagine anyone else wanting, either. And I'm tempted to phone Goodwill & offer them the entire contents of my apartment. This little verse got stuck in my head a long time ago and refuses to leave, and I think that is because of the circumstances under which I ran across it... and those will require some backstory. Anyway! In the course of my Little House-addled 10-year-old life, I ran across this verse on a "verse a day" calendar. I was stunned. In fact, I was horrified. I took it to my mother, to confirm that it really was in the Bible and the calendar writers didn't make it up. I then went into a week-long mourning that I had been sinning by being so in love with the Little House way of life. (Which must have been really fun for my mother, by the way.) At the end of it, I resigned myself to not longing for the 1880s as I had done until then, and instead trying to enjoy my 1980s life for what it was. After all, Laura didn't have TV or a huge library full of books to read, as I did. There you have it: Backstory done & the effect of this verse on my innocent 10-year-old brain narrated. Tomorrow: adult perspective. You can keep your cute blogs! Down that road many hours lie. But hey, as long as I'm having fun, right? I think I've read the blog of every 25-to-35-year-old at South Plains over the course of the last few days (and if you're wondering, it all started with Lesley). And you know what? All those people have cuter blogs than I do. Not just because they have adorable children to look at, although that is part of it. No, it's because they all have fun, scrapbook-y like backgrounds with lots of bright colours and fun shapes. Then I come back to my own blog. Meh. My blog isn't pretty; it's functional. (Much like myself, ha ha ha.) I toyed with the idea of changing my background for about 5 seconds on Sunday afternoon. And then I decided that I like by blog, as boring as it is. So, you can all keep your pretty blogs (and please do-- I need something pretty to look at from time to time), and I'll stick with plain Jane. Because it takes enough effort to come up with something intelligent to say, and I don't dare divert that energy to cuteness. Chad and I have had a string of varied discussions today. This is nothing unusual for us, who can discourse for 20 minutes on which is the best route to take across the courtyard to check the mail. However, we ran a race, attended a funeral, and went out to lunch all in the space of three hours this morning, which is NOT usual for us who like to do one thing and then take a break for talking about it. So in the course of our conversations this morning, I mentioned two different verses that have stuck with me since I first heard them (or at least, since I first consciously registered them). And that led me to thinking that I'd like to blog about the words that stick with me. So, expect this to be an ongoing series as I randomly remember things. "It never gets easier/It only gets easier if you do it." These, as you may have noticed, are conflicting ideas, but they have both stuck with me. Why? I was sitting in a womens Bible class about four years ago, and the teacher was talking about making a regular habit of praying/Bible reading/etc. She made the comment, "It's like exercise; it never gets easier." At which point alarms went off in my head & I drew a great big "?" on the page where I was taking notes. Incidentally, this class happened after I'd been solely a cyclist for over a year, so I knew better-- cycling had certainly gotten easier as I went along. I didn't bother taking it up with the teacher, because I really didn't even know where to begin-- and even if I had done, it was already said & there was not much chance that we'd go back to the point at the next class. But I did discuss it with Chad & others over the course of a few weeks and arrived at the conclusion which I now hold on to: "It only gets easier if you do it." So far, I've found this to be true in a lot of areas of life, especially in exercise. It takes work-- and lots of it-- to break bad habits and form good ones. But it doesn't get any easier if I give up. It doesn't get easier if I only half-heartedly try every few days or when I'm in the mood. It doesn't get easier from sitting around thinking about it. It does get easier if I do it. Both halves of this thought have stayed with me, because the first half prompted me to think through the second half. I don't know how many times I've been in the middle of a run, wanting to give up, and the thought that comes to mind is, "This is the only way to make it easy. It only gets easier if I do it." And such is the way with many things-- they only get easier when practised. So, I will continue to practise. There are a lot of kids in the running club. I enjoy watching them, because some of them have the sprint-then-walk-then-sprint approach to running, while others are sloooooowly learning the importance of pacing themselves throughout the race (one of the local PE teachers, who is also in the running club, is responsible for most of them learning how to pace). It's fun to see. I happened to look around this morning in time to see two little girls, who are coached by the aforementioned teacher, finish the running portion of their warm-up & begin doing some lunges across the grass. I was pretty impressed with them because a) they remembered to do lunges at all, and b) they were doing them with good form. And then I saw, following behind them, a little sister who looked to be about three, also trying to do lunges. She would take a big step, then look at the older girls, then take a big step while bending her knee, then take another big step & forget to bend her knee. So cute! The older I get, the more I realise just how many small eyes are watching and how important it is to be careful of my words & actions, especially when around little eyes & ears. But that's a hard message to understand when you are still pretty small yourself, so I was also impressed with the elder sister that she didn't shoo off the little girl, but instead took her hand when they were finished & led her back to their mother. What a great sister she is. I love the family at South Plains with all of my heart. And today that heart is aching. I don't have statistics, and I'm not that interested in finding any, but it seems that our congregation has suffered a disproportionate number of heartaches when it comes to children. We have had too many miscarriages, serious illnesses, and losses, and those are just the ones I've heard about. There are many, many people who have spent hours in prayer for these precious children; some little ones have recovered as we hoped, and some have had to cope with chronic conditions for the long haul. And some, as much as it hurts those left behind, have gained the ultimate victory. Gracie was 15 months old when she was called home this morning. I bet she met up with her Grandma as she arrived. I bet she played with Jesus for a while. I bet she is already making friends with some of the other precious little ones that have been called earlier than we would have liked. I bet she will be watching over her family as her sisters grow older; someday she will no doubt become an Auntie and will have a beautiful vantage point from which to see little nieces & nephews. I bet she will send down a kiss & hug every time her parents look at her picture. My heart breaks for her parents, who are younger than I am; why must they face such loss so early in life? And for Gracie's grandparents, and her aunts & uncles, and her small cousins-- her little life has touched so many people. She leaves behind a hole in so many hearts. We will see you again, Gracie. And we will rejoice together that we have gained the victory in Jesus. I wrote a letter to the Busyness Gremlin back in November, telling him it was time to go. Apparently, all he really did was hide in a closet while the Marathon Gremlin ruled my life. And then, on February 15th, that nasty little monster sneaked back out and started stealing all my time away again. I planned to spend the second half of February enjoying the Olympics. I had this bright idea that I could keep my feet up, enjoy some tea, and cheer for the athletes of my choice. I was ready to stay in and not run for a little while. In real life, NBC has the worst signal of any other network in Lubbock, so there was an unfortunate lack of cheering at our house (but I did manage a large amount of whining about how much I hate NBC). It turns out that there is one activity after another demanding my attention. And I can only drink a certain amount of tea before my organs start to float away. The first week of March has not, unfortunately, been any calmer. In fact, it's been worse, because I'm back to running. So, here I am, cancelling some activities and otherwise trying to slow down my life. Again. I don't care if "everybody's doing it"; I don't want to be busy. I love my life calm. And now, I'm going to root out that little demon and send him packing.